As the 2018 Hoboken and Jersey City Real Estate market comes to an end, we once again look back at the year in review to see how investment properties are reacting to the new growth in property development. With over 30 new high-rise developments either at or near completion in the greater Jersey City and Hoboken area, we have experienced 9,000 new apartments and condos come to the market. This is just the beginning of the 50,000 new units that are expected to populate the Hudson County waterfront. With the completion of each new development, property owners are now offering major incentives to achieve full occupancy including modern amenities, no broker fees and anywhere from 1 to 3 months of free rent. The data shows that the competition between the corporate and individual real estate investor is having impact on the landlord’s decision to sell their investment. This past year we have seen a predictably large increase in active listings come to market with 44% of all listings having a previous rental history. 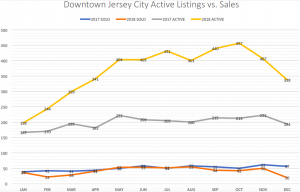 This appears to be the preponderance of the increase in available listings in 2018 and is a dramatic increase from three years ago where listings from investment properties were just 17% of all sales. 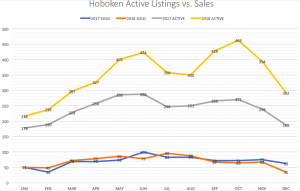 While available listings have dramatically increased this year, sales have remained consistent over the same timeframe. The growing disparity between the available listings and available buyers will undoubtedly increase the Days On Market (DOM) a listing will have as well as decreased offers from the available buyers pool as buyers will have more options to choose from. 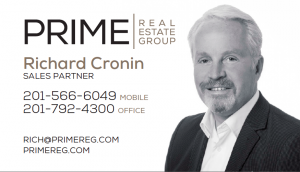 As an investor, it’s important to review your quarterly valuations that your agent is providing you to make sure the value of your investment isn’t dropping due to aggressive sales in your neighborhood. Additionally, keep an eye on your capitalization rate (net income/property value) to make sure that it doesn’t drop below the yield of a 10 Year Treasury bond. Using this basic benchmark will allow you to identify if you are adequately being compensated for the risk you’re taking by investing in real estate.